Magic Leap promised to add “another dimension to computing” and “change how we experience the world.” In interviews and sneak peaks, the company gives the impression it thinks all previous attempts at VR and AR tech are a bit silly in comparison to what it’s built. Soon, we’ll finally know if that’s the truth — the Magic Leap One will finally be available from some AT&T locations starting in April. That sounds … a bit complex. And it is. But Magic Leap believes our brains don’t need all the data. Instead, it can serve up only a limited selection of visuals and rely on our brains to work through the rest. The company hasn’t gone into specifics about how its approach works, but similar ideas are not unheard of. Nearly all the players in the VR space have plans to implement foveated rendering, a technique that lowers the detail of areas outside your current focus. It works because the detail of our peripheral vision is much lower — yet, because of how our brains work, we don’t actively notice it. The overall design seems like a sci-fi take on steampunk goggles. Though much smaller than an Oculus Rift or even the Microsoft HoloLens, the Magic Leap One is much larger than a pair of sunglasses. Multiple lenses mounted on the exterior include the cameras and light sensors that image the world in front of you, so AR experiences can be layered over it. “When you make digital penguins walk off the edge of the coffee table, they fall off the edge of the coffee table, just like real penguins would,” the company says. The Magic Leap One latches on your head with just a single loop. There are no straps or Velcro involved. It looks nice, and we presume it works like the Acer Mixed Reality headset and the Microsoft HoloLens, both of which use a rotating tensor to tighten until they’re secure. It’s a comfortable and lightweight approach, but we imagine it’ll work better for some people than others, and it likely won’t feel as secure as an Oculus Rift or HTC Vive. While the goggles themselves are round, photos appear to show rectangular hardware behind them. That suggests the rounded design is exactly that, and the internal hardware might look like the HoloLens. The field-of-view has a 4:3 aspect ratio measuring 40 degrees across, 30 degrees vertical and 50 degrees diagonal, which is similar to the Microsoft HoloLens. Magic Leap provides its AR goggles in two sizes to accommodate various eye distances and head shapes but doesn’t use prescription eyeglasses with the goggles. Instead, lens inserts based with a personalized prescription must be purchased separately. But the kit does include swappable nose pieces and other parts so that the goggles fit snugly on the face. While the headset is the start of Magic Leap One, the company’s tiny hockey puck-shaped Lightpack miniature PC that can’t be stuffed into a pocket due to cooling issues and its overall size provides the power. The headset will only work with AR experiences that are designed specifically for it — or, perhaps, ported over from another platform. The Lightpack is powered by Nvidia’s Tegra X2 “Parker” all-in-one processor with six CPU cores and 256 GPU cores. The hand-held PC also includes 8GB of system memory, 128GB of storage, one USB-C port, and Wireless AC and Bluetooth 4.2 connectivity. The built-in rechargeable battery promises up to three hours of continuous use and recharges via an included 45-watt USB-C charger. The controller supports haptic feedback vibrations and six-degrees-of-freedom tracking. Similar to the controller provided with the Oculus Go and Gear VR, it includes a circular touchpad with a ring of LEDs, a shoulder button, a trigger button and a home button. The embedded battery lasts for up to 7.5 hours and is recharged by an included 15-watt USB-C charger. Controllers like this don’t work well. Perhaps Magic Leap will be used primarily without a controller. While the Magic Leap One looks different, a lot of people have mentioned they “wouldn’t want to be seen” in them as they’re not the most practical fashion statement — but you’re not supposed to walk around town in them, anyway. While Magic Leap hasn’t explicitly said you can’t take them on a hike, every demo, tidbit, and game has involved AR experiences that take place inside, in a single area. The display technology also likely has its limits. Magic Leap says it works by projecting light in some fashion, and every projector fights against outside light sources. In a very bright environment, like a park on sunny day, a projected image can become almost impossible to see — even on the world’s most powerful projection equipment. HoloLens developers have already struggled with this problem. In short — this isn’t Google Glass. Magic Leap One doesn’t seem meant for use outside the home or office, rendering its style less of an issue. 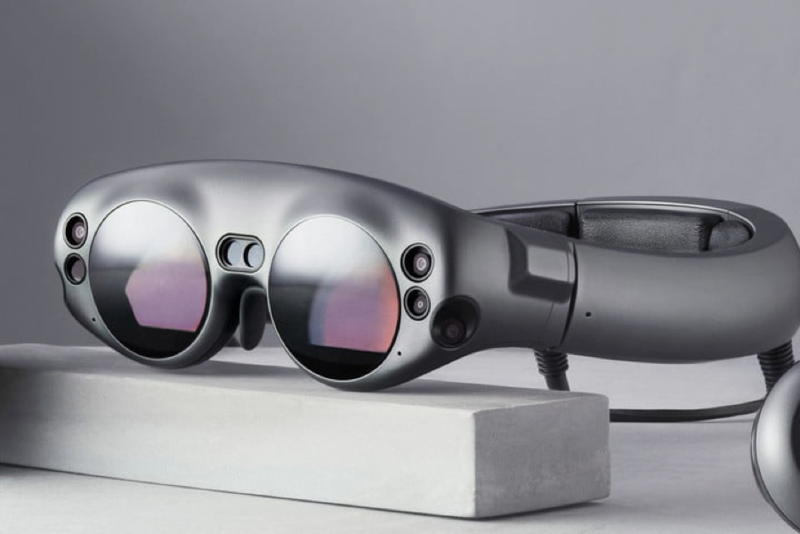 The Magic Leap One Creator Edition launched on August 8, 2018 for a starting price of $2,295. It initially launched in Chicago, Los Angeles, Miami, New York, San Francisco, and Seattle. The kit includes the headset, the Lightpack computing pack, the handheld controller, the Fit Kit (nose and face pieces), chargers, and a Start Guide. Now, the headset is coming to consumers too. AT&T has announced the Magic Leap One will be available from flagship AT&T stores in Boston on April 1, Chicago on April 3, San Francisco on April 6, and online on April 5. The consumer edition of the Magic Leap One is the same price as the developer edition — a hefty $2,295.